… if you’re living in tomato heaven like I am, you’re probably looking for new ways of preparing it. There are some things in life that are perfect. You really shouldn’t (and can’t) try to fix them. The combination of tomato and basil is one of them. Even the great chef Jean Georges Vogerichten can’t think of a better combination. But, what Vongericthen can do here, is improve on the presentation. I have had the pleasure of eating at his eponymous restaurant in New York on mulitple occasions and its sister bureau in Shanghai as well as his restaurant ventures Perry Street and Vong’s Thai Kitchen (not really Vongerichten controlled). Among the many things that dazzle me about Vongerichten’s cooking is his specatacular artistry and use of *natural* colours with food. Even composed plates with cooked meats and fish pop with technicolor vibrancy. 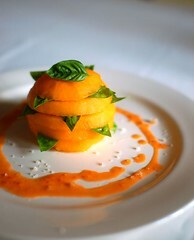 So, I guess I shouldn’t have been surprised by a gorgeous orb of summer goodness that appeared in glossy colorific print in his cookbook, “Jean Georges: Cooking At Home with a Four-Star Chef.”It was a glowing red tomato encircled with leaflets of basil fluttering up and down the sides. I had to reproduce it. The ingredient list was short – just five. The time involved – nearly zilch. The wow factor – (as Mastercard puts it) priceless. I had some yellow heirloom tomatoes, so I used them instead of the familiar red variety. In the initial photo run, with Vongerichten’s basil oil, the color of the green oil was “off,” so I substituted a simple tomato vinaigrette that I make and use to dress my tomato salads with. My tomato vinaigrette (pictured above) recipe follows. 1. Bring pot of water to a boil. Core the tomatoes, then make a small ‘x’ on their bottom (flower) end. Drop them into the boiling water and remove when their skins begin to loosen, about 30 seconds later. * Drain, then immediately submerge the tomatoes into a large bowl of ice water. When cool, peel them, then cut horizontally into 4 or 5 thick slices. Discard the bottom slice of each tomato (stem end*), but keep the other slices in order; they’re going to be restacked. Sprinkle each of the slices with salt, pepper, and a few drops of sherry vinegar. 2. Drop 1 cup of the basil leaves into boiling water for 10 seconds, then remove and rinse in cold water immediately. Place them, still wet, in a blender with the motor running, drizzle in the olive oil. 3. On individual plates, reassemble the tomatoes with the flat side down, putting a basil leaf or two between each later. Surround with a little basil oil, then sprinkle the whole thing with salt and garnish with a little more basil. * 30 seconds was the upper limit in time for me. Watch your tomatoes carefully so that don’t start to cook. ** I did not discard the bottom slice, but trimmed it if it was uneven so as ensure that the tomato, when restacked, would be level. Method: Blend all of the ingredients except the olive oil in a blender. Slowly drizzle in the olive oil to emulsify. Transfer to a non-reactive container and use immediately or refrigerate up to 1 week. ~ by ulterior epicure on July 31, 2007.